Luxury accommodations for the turkeys at the Willard Intercontinental Hotel. The National Turkey Federation paid the bill for the fancy lodgings as they have in the past. Today is the day of the weirdest of all presidential traditions — the turkey pardon. How did this even become a thing? It turns out the tradition is a very young one that technically only extends back to President George H. W. Bush. So, although turkey pardoning was almost a thing for quite awhile, it didn’t become official until 1989 under President Bush. At the ceremony he said, “Let me assure you and this fine tom turkey that he will not end up on anyone’s dinner table. Not this guy. He’s granted a presidential pardon as of right now. Allow him to live out his days at a children’s farm not far from here.” Over the years the turkeys have gone to different Virginia farms to live out their days. And the tradition has only gotten hokier since. Every year a pair of turkeys make their way to the White House from different farms around the country. There are always two in case something happens to one or it refuses to behave for the ceremony. Consider the second turkey an understudy; ready to step into limelight in a moment’s notice. 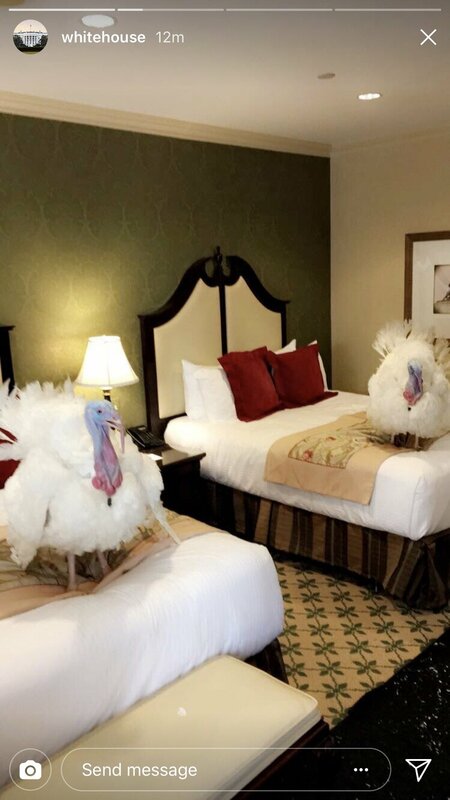 Only one gets the official on-camera pardon, but both turkeys are sent to live out the rest of their lives in turkey retirement. They often have funny or patriotic names, which have included: Liberty and Freedom (2001); Biscuits and Gravy (2004); May and Flower (2007); Pumpkin and Pecan (2008); Mac and Cheese (2014); and Tater and Tot (2016). This year’s turkeys’ names will be announced just before the ceremony. It is certain the 28 year old tradition will continue as President Trump pardons the next poultry pair in just a short while. While we prepare to consume delicious turkeys for Thanksgiving, we can take a moment to enjoy the two who got away. Happy Thanksgiving!